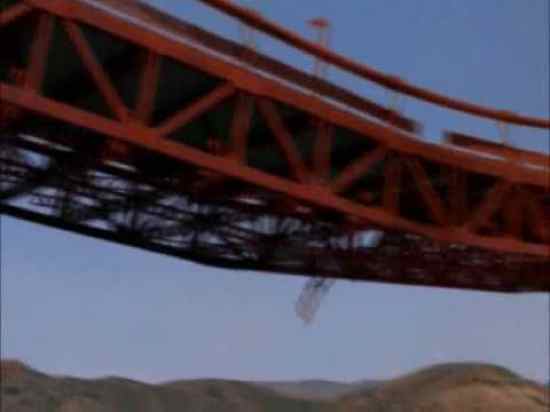 To celebrate the most colossal cliché in all of modern entertainment, let’s count down ten famous depictions of the demise of the Golden Gate Bridge, from disaster movies, superhero movies and various other media. These scenarios are listed in order of reverse probability, with #1 being the least likely to happen in real life. Be warned, this list is highly opinionated and contains puns. In this made-for-television-movie a magnitude 9.2 earthquake strikes San Francisco Bay, tearing the bridge in half (this is besides a 10.5 quake that strikes Los Angeles.) Despite the cheesy music and cheesier acting throughout, the collapse sequence is surprisingly well-done and convincingly accurate, as the bridge twists under immense forces before finally breaking at the point exactly between the towers, which is logical. The visual effects team did well in knowing their own limitations and the sound effects team succeeded in picking up the slack, such as when the cables snap. An exciting stomach-in-your-throat moment occurs when the road falls out from beneath the cars like a trap door. Any criticisms to be made about this depiction must be based on minor details and are no fault of a TV-budget production intended for a mass audience, unschooled in seismology and engineering. In Terminator Salvation, which in 2009 completed a 25-year span for the Terminator franchise, John Connor crosses the bridge in his approach to the Skynet headquarters in San Francisco. The context is a war between humans and self-aware robots: a motif so prevalent in science-fiction that it may have, itself, crossed into the realm of the disturbingly inevitable. After all, history demonstrates a fascinating relationship between sci-fi and real-life technological advancement. The development of submarines and satellites, for example, were both predicted in novels. No word yet on any cloned dinosaurs, however. But even accepting a robot war as man’s destiny, the partial destruction of the Golden Gate Bridge as a direct result would be a trivial consequence to say the least. This move was featured recently on the Top 10 Worst Blockbusters in Recent History. The Golden Gate Bridge is hardly featured at all (if you weren’t looking for it you probably missed it), but the fact that they included it demonstrates how hard it is for some people to avoid a tempting landmark shot, and I will include it here just to get my own jabs in. You see, I can live with a car narrowly escaping falling buildings and opening crevices, as long as there’s something close to a rational explanation as to why the earth is experiencing total geologic upheaval in the first place. Sources online cite something called the “Pole-shift” hypothesis, but even these are far-fetched and quite vague. Of course the whole point is that it marks the end of the Maya calendar. The problem with this, however, is that the Maya calendar, like every other calendar, was based on astronomy, not geology, providing even less of a defense for the movie. Also, if you’re writing a script and you want to invoke any sort of mystic prophecy, it should be the tragic, self-fulfilling kind the Greeks taught us. Instead, 2012 fails in making the Maya connection even remotely interesting. It even lacks the heavy-handed political tones The Day After Tomorrow relied on. Regrettably, survivors prove it wasn’t the end of the world after all. So what’s the point? The point is this: if you must sell tickets to nothing more than a premise, at least make it a decent one. For the sake of not overdoing it, let’s set aside the rest of the scientifically laughable material in this movie and focus on the bridge scene itself as an isolated subject. All there is to know here is that the earth has lost its magnetic field—its source of protection (this part is mostly correct) from the sun’s deadly radiation. Suddenly this one beam of light comes straight down upon the bridge and burns it in half, causing its collapse. Now although it’s true that the sun’s electromagnetic emission is far from uniform (making one rogue beam plausible enough), the fact that it lands directly on a major cultural landmark is such an enormous coincidence that it insults even a child’s intelligence. (The bridge covers roughly 0.00000048% of the Earth’s surface.) There’s also gross inconsistency with the radiation’s intensity and its effect. It gives one man a second degree burn on his arm, yet at the same time it turns the bridge’s suspension cables into molten iron instantly, all while the nearby cars appear unaffected, except for their tires melting and windows cracking. Unlikely indeed. Oh well, it’s still not as bad as a lightning shower inexplicably striking the entirely stone Roman Colosseum. This inclusion is unique in that instead of a full-length movie, it’s merely part of the theatrical storyline within the video game Red Alert 2, from the C&C series. In it, Soviet artillery, submarines and zeppelins are shown attacking San Francisco as part of their invasion of the US. So, technically, the only means by which this exact scenario plays out is if the nation known as the USSR is restored to its former power and glory. Difficult, granted, but not impossible. There are other particulars within the Red Alert narrative involving Albert Einstein and time travel, but again, our subject matter is with the bridge only, which keeps it comparatively credible for this list. Back in the aftermath of Hiroshima and Nagasaki, when the world was collectively uneducated and rightfully terrified as to the lasting effects of an atomic blast, a wonderful movie genre was born giving supernatural size and strength to random marine life, Godzilla being the best example. In one such movie, It Came From Beneath the Sea, the creature was an octopus and, wouldn’t you know, it destroyed the Golden Gate Bridge. It’s not hard to be impressed by Ray Harryhausen’s special effects in this movie. They’re a little rough-around-the-edges for today’s eye, but were clearly achievements in their time. The pure vintage appeal might actually do the most in lending believability to the beast’s clumsy rampage. The octopus, thankfully, wasn’t the last of Harryhausen’s gigantic monsters: he went on to create a Cyclops in The 7th Voyage of Sinbad, a Hydra in Jason and the Argonauts, and others. And this isn’t the last time an octopus gets mentioned on this list. Cause: Fight Between Alien Robot and Reese Witherspoon, et all. The scientific debate of extra-terrestrial life has pretty much reached a consensus that it probably exists somewhere in the immeasurably large universe. The real debate is when, or how, the first encounter with Earth humans will occur, and what will happen if the visitors are hostile. One possibility is that the government employ a team of monsters, voiced by an all-star cast, to fight the good fight. There’s not much more to say here, except that perhaps the most amazing part about this scenario is the fact that there are, amazingly, still three more items on this list. No, the dilemma here is with the school bus, full of innocent children (presumably they are innocent), that happens to find itself teetering precariously on the bridge’s edge. I mean, come on! What are the chances? If just one of those children shoots a spit-wad then the balance could be tipped. Even for Superman, this is simply too difficult to accept. For this reason and the aforementioned ones, Superman earns a spot at #3. Where to begin… First of all, the shark (a megalodon to be precise—Listverse devotees should know this specimen) is liberated from an ice cap (an ice cap which was almost certainly formed several million years after the extinction of the species) by a pack of whales that strangely collide into the frozen mass. But no matter how it got there (Michael Crichton could have just as easily cloned it with some frog DNA) the fact that a giant shark is on the lam isn’t the real problem. Nor is it necessarily a problem that, although cartoonish, the shark jumps up and bites the bridge in half, but we’ll get to that. The real problem is that shark has absolutely no reason whatsoever to do so. The movie attributes the shark’s rage to two factors: A natural hatred toward his titular rival, the giant octopus, who during this time is wreaking havoc on Tokyo, and also that being frozen for ten million years has rendered him (I wish I was making this up) violently horny. This whole joke may possibly have been a blundering attempt to pay tribute to It Came From Beneath the Sea, except they got the animals switched and the special effects are somehow worse than the 40-year predecessor. In any event, the shark leaps up, chomps down, and the bridge disintegrates with little fanfare. The vertical feat garners faint believability only by the fact that, earlier in the movie, the same shark jumps up and attacks a trans-oceanic passenger jet in mid-flight. Unlike Mega Shark, which deserves a dubious “so-bad-it’s-good” distinction, the Golden Gate Bridge scene in X-Men: The Last Stand, in which Magneto moves the bridge to Alcatraz, is just plain stupid. This scenario is unlikely, first and foremost, because it is so unnecessarily inconsistent with Magneto’s character. In X-Men 2, he pulls the metal out of a man’s bloodstream to create a platform upon which to transport. Now all of the sudden he acquiesces to tamely hoisting objects, Yoda-style? Why not just do the same morphing trick? He had the metal. It’s not only less creative but the character wastes a lot of time doing it this way. Other lapses in creativity and common sense are even more painful to watch. When the bridge finally rests on the island, neither the towers nor the primary cables are attached to anything, and yet the bridge is still hanging by its cables. The only thing more unsound than a suspension bridge with unattached cables is the logic that Magneto preserved the general position of the bridge’s parts for purely sentimental reasons, or, that the bridge never needed it’s towers or cables in the first place, which would make it the greatest hoax in history. The suspension of disbelief could, at this point, use a little more support. The CG effects do little to help. The bridge illogically breaks apart at a location close to the base (yet not at the base which would make too much sense) and the severance of the road section is way too clean, almost as if Magneto was trying to saw it off, yet not clean enough that he actually did, or could have. I suppose the lure of cheap animation work proved too much to resist for project managers. It’s a shame, too, because the trilogy up to this point was much higher than this, standing on style, not extravagance. To their credit, the distance to the island is approximately the same as the span of the bridge, so it would work, in that respect. But Magneto is, ultimately, the least likely to ever be a real person. He and Gandalf both.